Gripe Water for Baby Colic. Baby colic is not unusual at all for the newborns. And parents are just willing to try anything that can soothe their baby. As per National Institute of Health, 1 out of 5 babies get colic and cry inconsolably. Babies with colic often cry at a particular time of the day.. Exact causes of colic are unknown. 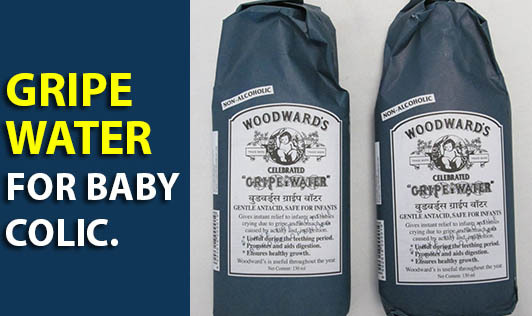 Gripe water is one of the oldest and most preferred tonics for colicky babies. It was first commercially produced for sale in the year 1851. Woodwords is the most popular and preferred brand of gripe water in India. A study published in a pediatrics journal says that at least 10% of the newborn babies are given herbal supplements in the first year of birth. Did you know? Gripe water was discovered by William Wood in 1840s. Its original mix contained extracts of dill, sodium bicarbonate, alcohol, sugar and water. But the gripe water available in recent times is free of alcohol. Also, there are no known side effects of gripe water. Gripe water neutralizes excess acid in the stomach and breaks down trapped air bubbles that cause wind which is a common symptom associated with colic. Although Woodwards Gripe water has been the original medicines since ages as it relieves discomfort of colic to babies, various new brands have come up in the market with different compositions. It is always wise to buy what suits your baby or just stick to what your doctor suggests for your colicky baby. It is also important to know that whatever brand of gripe water you buy, it should be used within fifteen days of opening the bottle.